Gaza is the most densely populated urban area in the world with over half its 1.6 million population – children.Terrified, traumatized children. 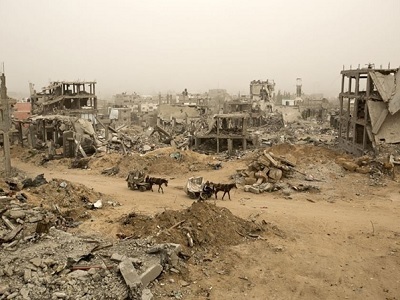 Gaza is a cemetery for over a thousand war-slaughtered children, a death camp for 800,000 maimed and traumatized surviving children waiting, waiting, waiting for the next inevitable Israeli pestilence of bombs and sheer terror. For little Hamza, we, who are privileged and safe, must demand that our governments immediately honor their legal obligations under the Arms Trade Treaty and end their arms trade with Israel which everyday commits crimes against humanity and war crimes against the people of Palestine under Israel’s illegal military occupation and colonization in breach of international law. The adage ‘to live is to resist’ applies to little Hamza. 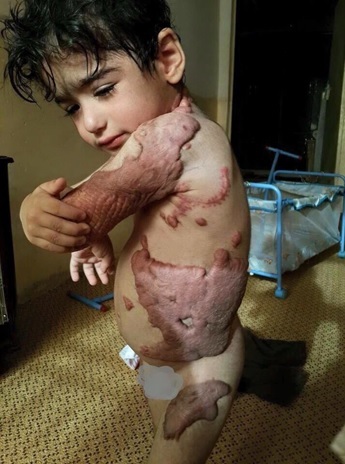 The scars are the stigmata of his heroic sumoud ( steadfast resistance) to Israeli violence. Every cry of pain was a cry of resistance. Like sumoud, ‘Hamza’ in Arabic means ‘strong, steadfast’. Palestine is Hamza. This report about the horrible harm done to little Hamza, is another example of the atrocities being committed by Israel. How could we (the U.S.A.) continue to send billions of dollars to that terrorist country? I need to imagine how much better the Middle East would be If Israel would not be there any more. We must ALL work together to make this a reality!